Prepare yourself for a fantasy romp of epic proportions. When the days stretch and the land bakes, dragons will again scour the sky. A city of bones and a city of gold plot against each other while the rebellion gathers strength. A young man is caught in a tempest of intrigue that will forge a new era of freedom, or forever scar the land. 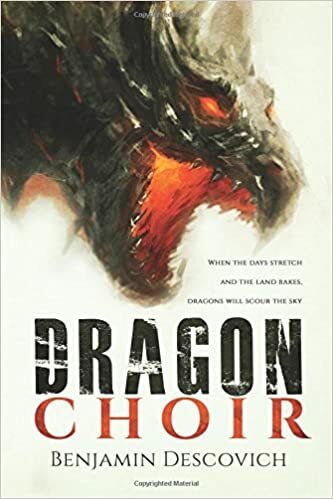 He must discover the secret of the Dragon Choir to save his father and end the stranglehold of an unforgiven nation. Fast paced action sautéed in a deliciously immersive narrative style. Intelligent storytelling will teleport you into a rich and expansive world of magic where two powerful cultures collide in a deadly dance of politics and espionage. Both must contend with the seasonal migration of dragons lusting for gold and a rebellion gnawing for an end to slavery. Sword and sorcery explode from the pages on an epic scale following the exploits of a young man with a bounty on his head, a beautiful assassin who keeps her secrets close and a feisty rebel general with a plan to topple his oppressors. Only one thing can bring them together. The Dragon Choir. Get one of my ebooks free! Go to benjamindescovich.com today. I'd love to hear from you. The vendor walked out of the alley and onto Merchant Circuit proper. He looked up and down the road and returned with a knowing smile. “You’re set to go. Want the Good Mother for your travels?” “Thanks, but no. I don’t have anything to give.” Elrin shook his empty pouch to prove it. “If you’ve pissed off a guilder then you’re all right with me. See now, with no ink on you and none on me, we’re almost brothers.” “If it’s all the same, you keep it.” Elrin left the Ona statuette on the table.